​Related struggles for other areas are listed below the DAPL states. Fighting the pipeline in Iowa is Mississippi Stand (and keep up with the Mississippi Stand Facebook Page) as well as the Bakken Pipeline Resistance Coalition (of many Iowa groups). Bold Iowa and IowaCCI are two of the more active or at least visible groups in the Coalition. On any day when there was or is no protection action shutting down construction in North Dakota, there's a good chance there will be one in Iowa. (2) ***QUICK LINKS : Show your Solidarity! Here's a whole bunch of links to all the other front lines fighting for our earth (Sabal, Bakkan,Diamond etc,,). Follow Them and Please ADD TO THEM! This article lists seven native struggles, some of which are not pipeline projects and are not listed below. ​Arkansas Rising is a collective of guardians working through direct action to stop the Diamond pipeline, a 20-inch diameter pipeline that would run 440 miles from Cushing, Oklahoma, to Memphis, Tennessee. The pipeline would cross more than 500 waterways, including five major watersheds. Construction has already begun. Donate to their efforts here. Stop Sabal Trail PipelineThe Sabal Trail pipeline, a 515-mile natural gas pipeline project, is being constructed from Alabama to Georgia to Florida. It threatens one of the largest freshwater aquifers in the world. 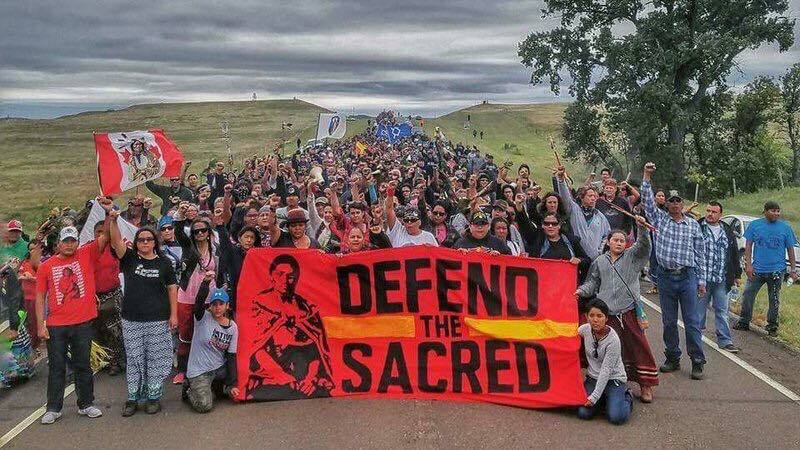 The Sacred Water Camp and Water Is Life Camp are ongoing camps in need of supplies, experienced organizers, and other people. An upcoming mass civil disobedience event is inviting all to mobilize in Florida. Get in touch here or donate to support the camps. Also support the organizing efforts of the SPIRET Foundation and Bobby C. Billie, one of the clan leaders and spiritual leader of the Council of the Original Miccosukee Simanolee Nation Aboriginal Peoples, in their efforts to hold regulatory agencies accountable for support of the pipeline. Contact organizers Shannon Larsen or email Beth Huss. From the Chesapeake Climate Action Network Website: "The natural gas industry is proposing a dangerous and costly detour from our region’s clean energy future: They want to build a web of fracking wells, pipelines, and processing facilities across our region in order to liquefy fracked natural gas and export it to overseas markets in Asia. The development of Cove Point, a liquefied natural gas (LNG) export facility located right on the Chesapeake Bay in Southern Maryland, is a linchpin in this plan. Dominion’s Cove Point facility is the first LNG export terminal slated for the East Coast. It would drive demand for a surge of new hydraulic fracturing, or “fracking,” for gas in our region and require an expanding network of new fossil fuel infrastructure. While the gas industry would profit, we would pay the price of scarred landscapes, polluted air and waterways, livelihoods at risk, and worsened climate change." MINNESOTA - Line 3 pipeline – Alberta, Canada to Superior, WisconsinCanada Prime Minister Justin Trudeau recently announced the government's approval of the massive Line 3 pipeline project, designed to transport tar sands oil from the mines of Hardisty, Alberta, to Superior, Wisconsin, through the heart of Anishinaabe territory and some of the most beautiful lakes and wild rice beds in the world. The Assembly of Manitoba Chiefs is challenging the Trudeau government's approval of Line 3. Follow and support Honor the Earth’s work, learn about ongoing resistance to Line 3, and follow community members’ opposition to the pipeline here. MONTANA - Buffalo Field CampaignFrom the website: "The Buffalo Field Campaign's mission is to, "stop the harassment and slaughter of Yellowstone’s wild buffalo herds; protect the natural habitat of wild, free-roaming buffalo and other native wildlife; and work with all people—especially Indigenous Nations—to honor and protect the sacredness of the wild buffalo." "The buffalo [more properly, bison] of Yellowstone National Park are members of the only continuously wild, free-roaming, genetically intact population in the United States. These animals are being unnecessarily rounded up and slaughtered—at taxpayer expense—due to exaggerated concerns about disease risks to a handful of cows." "Although bison are extremely rare, are designated Near Threatened on the IUCN Red List, are a species of national interest, are the subject of great controversy, and are clearly impacted by agency actions such as the issuance of livestock grazing permits and other activities in bison habitat, the US Forest Service does not consider bison to be a sensitive species or a species of conservation concern." From the Website: "At the same time as the president is taking positive steps to curb climate change, the federal Bureau of Land Management is making available billions of tons of fossil fuels on our public lands. The BLM’s recently approved resource management plans and environmental impact statements in Wyoming and Montana exemplify this disconnect to the extreme. The BLM’s Miles City (Montana) and Buffalo (Wyoming) RMPs keep open more than 10 million acres for coal leasing, on which the agency projects about 11 billion tons of coal would be developed. The plan also authorizes millions of acres for oil and gas leasing, with BLM projecting that 18,000 wells will be drilled. While BLM is required to offer alternatives to this coal development, the Miles City RMP’s five options are all identical with respect to coal and the Buffalo RMP involves only cosmetic differences with respect to coal." NEW MEXICO - Chaco Canyon From the Website: "The Bureau of Land Management is in the process of updating their Resource Management Plan (RMP) to finally evaluate the impact of fracking in the Mancos Shale, one of the primary industry targets in the Greater Chaco area. No full-scale field development is allowed without such analysis, but industry is drilling anyway. We’re fighting every well, and working to ensure the RMP Amendment prioritizes forgotten environmental and cultural resources." 12/9/16 Breaking: Lockdown at Spectra AIM Construction site at Hudson River Crossing. Six activists have locked themselves to equipment at the construction site where the Spectra AIM pipeline crosses the Hudson River. The Ramapough Lunaape Nation, a community in the Ramapo Mountains currently face the threat of the Pilgrim pipeline, which would transport Bakken crude oil from Albany, New York, to Linden, New Jersey. Meanwhile, Spectra Energy continues to expand its pipeline network so that more fracked natural gas can be transported and ultimately exported out of the country. Read about the history of the Ramapough Lunaape here, follow the developments at Split Rock Prayer Camp, and listen to Chief Dwaine Perry . From the Website: "Pilgrim Pipeline Holdings has proposed building two parallel pipelines connecting oil terminals in Albany, New York to a refinery in Linden, New Jersey. Bakken shale oil would be sent south; refined products (including kerosene) would be sent north. Their proposed route crosses 5 counties and 30 municipalities in NJ and 5 counties and 25 municipalities in NY...The proposed pipeline route travels through densely populated residential areas, near schools, hospitals and businesses, and would cut through environmentally sensitive and protected areas, including the Highlands region in NJ, which provides drinking water to more than 4.5 million people in NJ. Pilgrim’s proposal cuts across 3 major drinking water rivers, numerous smaller streams and two EPA designated sole source aquifers (the Ramapo Aquifer and the Buried Valley Aquifer) in New Jersey. In New York it crosses 232 regulated streams. A major pipeline spill could contaminate the drinking water for the several million people and dozens of municipalities who rely on these irreplaceable water sources." From the Website: "[Crestwood Equity Partner's] intention is to repurpose the crumbling salt mines underneath Seneca Lake’s hillside into massive, unlined gas tanks for three highly pressurized products of fracking: methane (natural gas), and propane and butane (LPG, or Liquefied Petroleum Gases) and to turn the Finger Lakes into a fracked gas transportation and storage hub for the entire Northeast.The LPG part of the storage proposal, not yet approved, lies in the hands of New York Governor Cuomo’s Department of Environmental Conservation." ​OREGON - LNG, pipeline, ? 1/16/17 12 Arrested at Valero in protest of pipeline. societyofnativenations.orgPlease visit the Big Bend Defense Coalition facebook page as well. 9/21/16 As we speak, the Trap Spring Archeological site is yards away from being destroyed by Energy Transfer Partners for the Trans Pecos Pipeline. Visit https://www.periscope.tv/willkeller/1nAKEDZVXLZxL to witness the site and its imminent destruction. 1/12/17 In Texas, two water protectors were arrested Saturday after locking themselves to heavy machinery to delay the construction of the Trans-Pecos pipeline, which is slated to carry natural gas under the Rio Grande and across the U.S.-Mexico border, where it will then continue to export terminals on Mexico’s Pacific Coast.- Democracy Now! Increase tourist visitation and careless desecration of sacred ruins. ​From the CCAN "No New Pipelines" Website: "EQT and NextEra are proposing to build the 301-mile Mountain Valley Pipeline from the shale fields of West Virginia through southwest Virginia. Dominion Resources is proposing to build the 600-mile Atlantic Coast Pipeline from those same shale fields, through central Virginia, to North Carolina. These are just two of four major pipeline projects being proposed for Virginia, and 19 across the Appalachian Basin. Despite significant opposition, the Federal Energy Regulatory Commission (FERC) has issued a draft Environmental Impact Statement (DEIS) for the first of the proposed pipelines: the Mountain Valley Pipeline. The DEIS for the Atlantic Coast Pipeline is expected in December 2016." From the Preserve Craig Website: "As proposed, the Mountain Valley Pipeline (MVP) project is a natural gas pipeline system that spans approximately 300 miles from northwestern West Virginia to southern Virginia – and as an interstate pipeline will be regulated by the Federal Energy Regulatory Commission (FERC). The MVP will be constructed and owned by Mountain Valley Pipeline, LLC, which is a joint venture of EQT Midstream Partners, LP and NextEra US Gas Assets, LLC. EQT Midstream Partners will operate the pipeline and own a majority interest in the joint venture." WISCONSIN - Back40 MineInfo: The Menominee Tribe in Keshena, WI is currently fighting to prevent an open pit sulfide mine from being established upstream from one of their most sacred sites; the mouth of the Menominee River. This is the birthplace of the Menominee people, and also where they have just recently have been able to seed wild rice, a major staple and traditional food source, for the first time in hundreds of years. This mine would also threaten the environment and wildlife in the surrounding area. 1/16/17 Wisconsin Tribe votes to evict oil pipeline from reservation - ​Bad River Band of Chippewa Indians cites successful Dakota Access opposition for decision to end right-of-way lease for Enbridge Line 5 pipeline. Aussies, if you have better groups/pages/websites please message them to /u/Al-GirlVersion! BRITISH COLUMBIA, CANADA - Petronas/Pacific Northwest Terminal – Prince Rupert, British ColumbiaThe Petronas/Pacific Northwest Terminal is a proposed liquefied natural gas plant on traditional Lax Kw'alaams territory Lax U'u'la (Lelu Island) at the mouth of the Skeena river near Prince Rupert, British Columbia. Plans call for a 48-inch diameter submarine pipeline to be dredged into estuary sediment to supply fracked gas from Treaty 8 territory. Ten Indigenous nations and 60,000 people in the Skeena watershed rely on fish there for food, commercial fishing, and cultural identity. The Lelu Island Camp has been set up on Lax Kw'alaams traditional territory to stop this terminal from being built without consent. 10/22/16 Water is life! We all must stand up!About 50 protesters entered the central Labrador site on Saturday and occupied an accommodation complex, prompting the company to remove about 700 workers from the grounds. The protectors have drawn support from across the province and country in recent days over concerns about methylmercury contamination that will occur when a 41-square-kilometre area is flooded behind the hydroelectric dam. The project is upstream from 2,000 Inuit and other residents in the Lake Melville region. One Inuk artist who has stopped eating to protest the project has said he’s prepared to die for his cause. 10/25/16 Canada: 99 Detained at Protest Demanding End to Tar Sands Pipeline (3rd article on this page). - Democracy NOW! From the website: "According to design specs, the Agua Prieta pipeline project would begin in Arizona, in the United States, and lead all the way to Sonora, Mexico. Along the way, the pipeline would cross 90 kilometers of Yaqui territory, which is protected by Mexican law. Building the pipeline without consultations that are deemed to be fair, transparent, and inclusive for all of the Yaqui communities would be a violation of the sovereignty of Yaqui land, community leaders say..Recently, members of the Yaqui tribe in Loma de Bácum won a moratorium against the construction of the pipeline. According to local media, however, Mexican authorities have announced that pipeline construction will continue because “one community” cannot stop “a project that will benefit future generations"
10/26/16 Protecting Sacred Land "What's at stake here? Man, it's the future." It's not just--In Arizona, Apache land protectors are fighting to stop a mining company from making a giant crater of their sacred land.